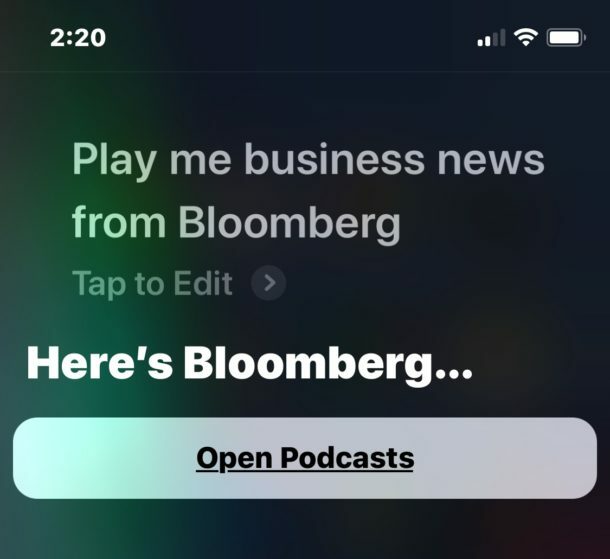 Siri for iOS can now play short daily news digests by request, allowing you to quickly hear news recaps from some popular mainstream news outlets and media sources. This is a handy feature if you want to get a quick blurb about what’s apparently newsworthy on a given day, and it works the same on iPhone and iPad. The news digests are short podcasts and usually between 1 minute and 7 minutes long, depending on the source and likely other factors, and can come from a variety of different outlets, including NPR, Fox News, CNN, Washington Post, CNBC, Bloomberg, and ESPN. The feature is also available in the UK and Australia, but at the moment anyway it does not appear that users can get news from international sources, or from outside of their home country. Or you can ask for news, which seems to default to NPR, with CNN, Fox News, Washington Post as alternatives. 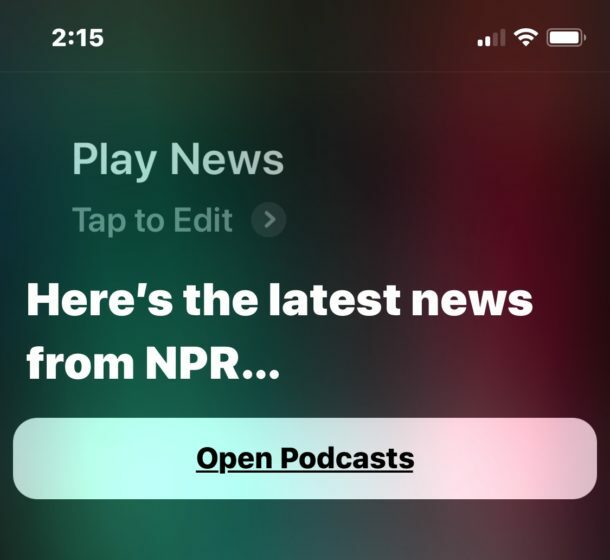 You must say “play news”, if you simply say “give me news” then Siri will instead return a bunch of headlines from the Apple News app and not read out any news to you. Note this feature is not completely foolproof yet, and there are a few quirks and failures. In particular, getting news from Washington Post and Fox News were a little funky in testing. Whether or not this is something from Siri or from those news outlets is not clear, but it’s worth mentioning since you may get confused if you encounter either issue. Additionally, in testing with Fox News, Siri was sometimes giving me news summaries from last year, rather than today. Try each a few times yourself, your mileage may vary. 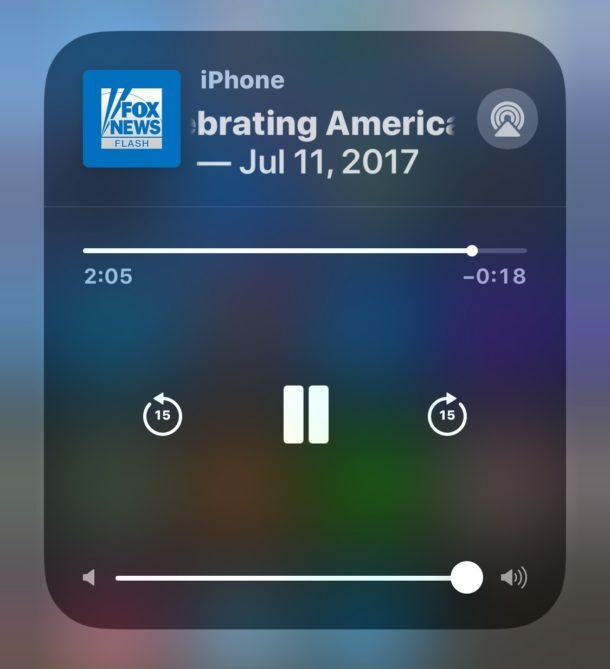 When the news headlines feature with Siri does work as expected, it’s a nice feature and offers a simple fast way to hear the days headlines from various news outlets. We can expect this feature to improve as time goes on, and presumably the capability will come to other Siri devices in the near future too. 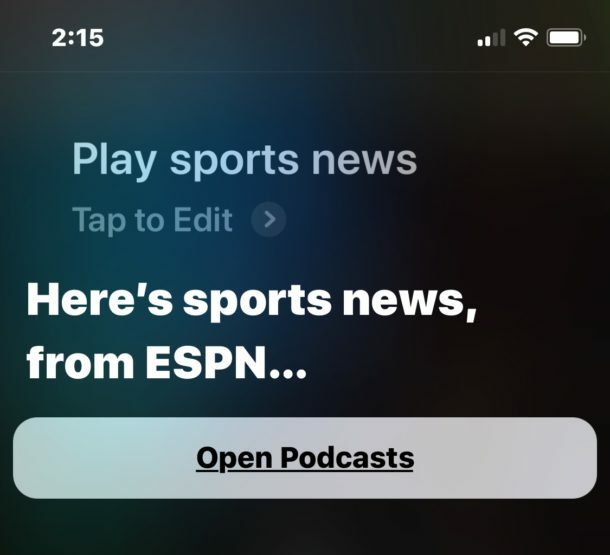 Maybe even some day users will be able to set their own default news choices for Siri, and play third party news digests and recaps as well, and play news from foreign and international sources, who knows? The feature is specifically mentioned in the release notes of iOS 11.2.5, but in testing you can usually get the news read to you with earlier iOS versions as well, give it a try on your iPhone or iPad and report back. The feature does not currently work on the Mac with Siri, however. 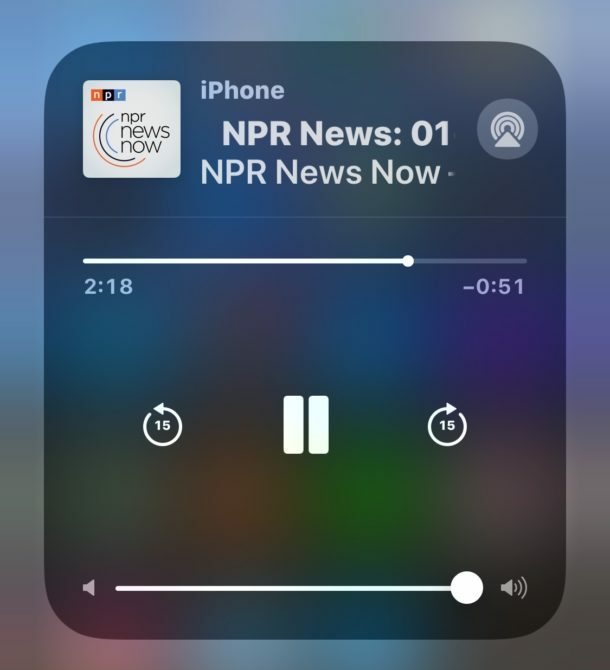 If this feature isn’t quite doing it for you, perhaps you’re not a fan of the short news podcasts or you’d rather have more detailed information, it’s worth mentioning that you can also have Siri read the screen to you in iOS, including articles on screen of an iPhone or iPad too, which is another nice trick that works in all iOS versions. Siri is so bad, I just don’t understand how this is a product they promote so heavily when the reliability and consistency is so awful. Every time I see or learn a Siri trick, I try it again, then inevitably discover some failure and remain disappointed. Amazon has voice recognition figured out, so does Google, why doesn’t Apple? 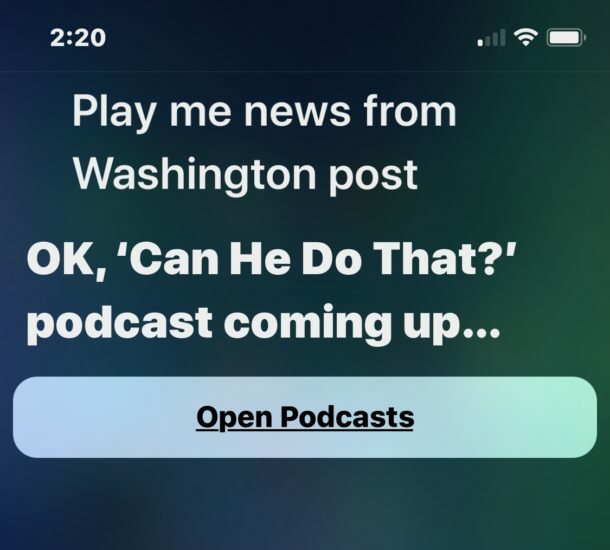 Simply does not work, I asked siri to play news from number of your suggested sources all siri said was sorry I cannot find ******** in your music. Those saying this did not work have probably not updated their iOS. The article fails to state this feature is only available from 11.2.5 onwards. Steve, I am running iOS 10.2.2 and it works for me. Why is Canada left out of this Siri news? Why is Australia in? Does Australia even have any news? Anyway seems it needs some tweaking. But I can get Siri to open Google news and CBC news so that’s enough for how. Why would anyone want news from one of those extremely biased, fake news sources anyway… Siri or no Siri? Oh sorry, I forget the sheep keep listening/following… never mind the fact they’re being fed “regressive” propaganda all day long. 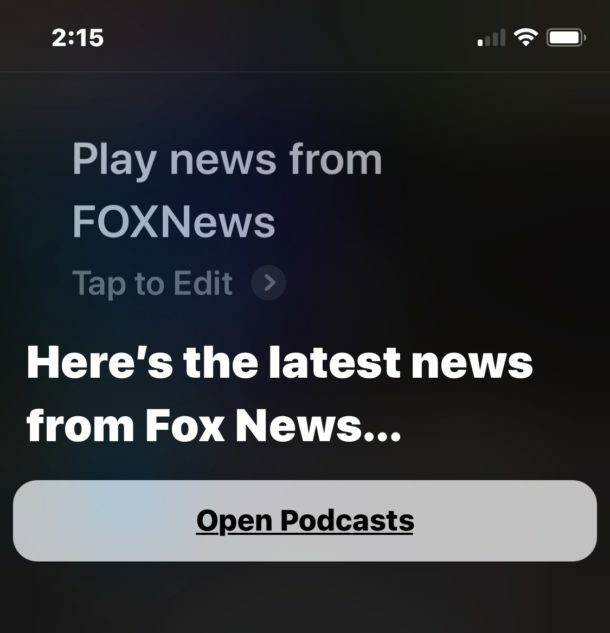 Siri doesn’t work for this because she doesn’t wish to hear whining, half-truths and outright lies the Main Stream Media throws our way either! What exactly is fake news? Is that what you call things you don’t like to hear? And what exactly is biased about getting news from multiple different sources, including Fox News, NPR, CNN, WaPo, Bloomberg, etc? These short podcasts are from their news divisions, not their opinion/editorial divisions. Getting your news from multiple different news sources and their journalists is how you *avoid* most bias in the modern American media environment of conglomeration. If you’re reading op/ed or listening to TV and radio pundits and op/ed, you are doing it wrong. Do you understand the difference between news reporting and op/ed punditry? Any ‘news’ organization worth a toot has a firewall between the two.